Hi, my name is Anita Lawrence and I am a glassaholic! I have been a self taught lampworker for about three years now and owe my learning to many of the great glass artists out there who are so generous with their art and share their skills by way of tutorials, articles and contributions to forums. It has been a steep learning curve but each session teaches you something new as many of the glasses do magical things in the flame and sometimes the kiln too! I do not work on a conventional torch. My husband is a welder and after seeing me struggle with my hot head and map gas, he set me up with his welders cutting torch and I still use it to this day. 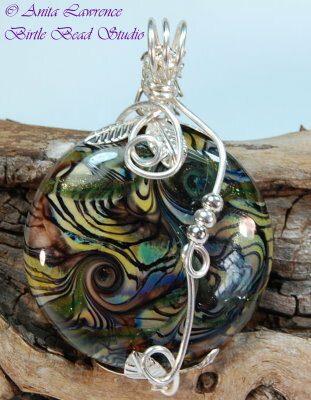 The beauty of this is that I can create work with Boro as well as soft glass. All my beads are fully annealed in my digital kiln and then I either sell my beads or use them in my jewellery designs, which I also sell on my website. I like to use a mix of technique in my jewellery, including wire wrapping and weaving, chain maille and bead weaving. Although I have been crafting since I could hold a needle, jewellery was not something that I had dabbled in until about five years ago when I came about it by accident. I was running a craft club at a local primary school and we made some earrings to go on Xmas cards. This led to a sell-out sale at the summer fair and with encouragement from good friends I started on my journey into the world of jewellery making. 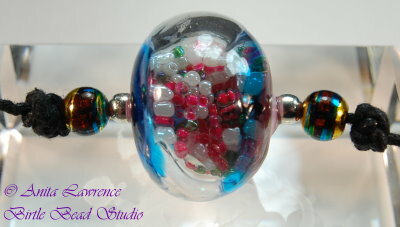 I discovered Tuffnell Glass at a bead fare, bought a starter kit and the rest is history! I have since had the honour of visiting Murano in Venice where a lot of the glass comes from and this has become one of my most favourite places and I long to return. I take my inspiration from all around me but mostly my work has developed through experimentation with this amazing media.